Last Tuesday we rode into Rio Blanco, in the rural, rural lowlands of Nicaragua, to visit an organization we'd been in contact with for a few years, so we'll be in Rio Blanco for a week or so. Agua Para La Vida (Spanish for "Water for Life") was founded 19 years ago toward the end of the dark war years when a CU Berkeley engineering professor came to this out-of-the way place for a visit with another charitable organization and found that there was no potable water at all in the village he was visiting. Being an engineer, he thought in terms of how to solve their problem with some water engineering, and he brought volunteers to the village over a period of a couple of years to put in a water system, complete with collection at the water source (a spring) and piping to distribution points. 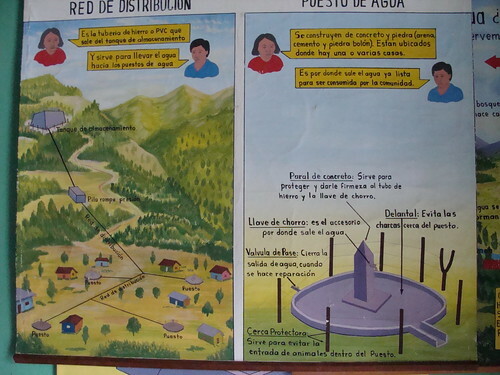 From that time to now APLV has grown into a modest but effective little organization, having completed more than 50 projects in the little villages mostly in the Rio Blanco area. APLV has an integrated approach to water: They don't want to just deliver a water project, because without the other aspects of healthy living it doesn't do much, and won't be cared for properly anyway. They work with the community to make sure that each household member gets trained in a variety of health management techniques, including handwashing, proper storage and handling of drinking water, trash management, and the like. And each household gets an outhouse; normally in these villages there are very few outhouses, and you can imagine the health impact of having no sanitation facilities at all. 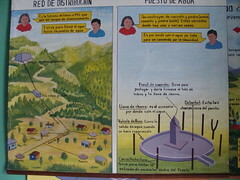 Finally, APLV works with the community on reforestation of the area around the water source, for two reasons. The first reason is that it's important to get a tree-covered area around the source to prevent cattle or other animals from fouling it. But even more important is that the source will have a tendency to dry up in the future if proper vegetation is not maintained in the micro-watershed that feeds the spring. We contacted APLV before heading this way and offered to help out where we could with computer issues, GPS management, and Autocad, and they put us right to work - it's quite a pleasure to see such a cadre of enthusiastic workers. Sometimes the workers in an organization like this can get a bit jaded or discouraged, working just as employees, but these people are all giving it their best, retaining their enthusiasm and commitment even after a decade or more on the job. It's interesting to see too how humble an organization it is (in the good way). They've always maintained a commitment to making sure that every dollar goes to the project, to items of value, instead of to overhead. So their office is not with the other NGO offices on the main street, and definitely does not have a fancy storefront. It's just a nondescript warehouse-type facility on a back street (a dirt street, like most of the streets here) and has a simple sign. Due to this same philosophy, APLV does not follow the signage practices of the other NGOs doing various projects here. (There are dozens of NGOs, or Non-Government Organizations, working here - you see them everywhere.) Most of the NGOs post a prominent sign after they complete a project, with an explanation of the project and the logos of all the NGO participants. We've seen these signs in little villages way out in the sticks ("100 outhouses, care of the European Union and World Vision", "Improved road, courtesy of the government of Japan", etc.) But APLV doesn't even put up a sign when the project is completed, for two reasons: First, because they want the dollars going to the project, not to a sign about APLV. Second, because the reality is that the water system and associated benefits are not just a gift. They are a cooperative venture in which the community has participated fully.